Viewers of BBC television news programmes on the evening of October 9th saw a report by Orla Guerin – usually the corporation’s correspondent in Cairo. 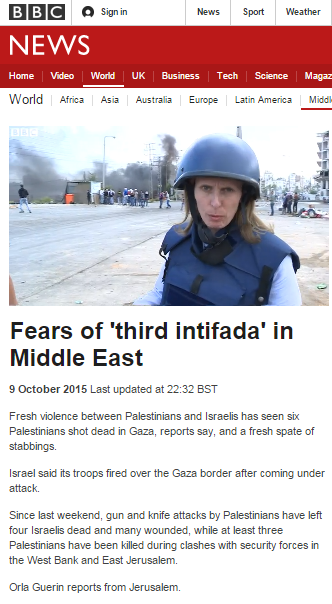 The report was also posted on the BBC News website under the title “Fears of ‘third intifada’ in Middle East“. Whilst Israel is of course in the Middle East, it is not the Middle East. That overly dramatic and exaggerated style – characteristic of Guerin’s reporting – continues in the introduction to the report, with audiences receiving clear early signposting telling them which side they should view as the underdog, violent rioters portrayed as “protesters” and Ramallah – under PA rule for two decades – presented as “occupied”. Either veteran reporter Orla Guerin is astoundingly under-informed or – like her colleague Nawal Assad – she has elected to deliberately amplify popular propaganda according to which “Palestinian Muslims consider all that compound [Temple Mount] to be the Al Aqsa Mosque”. Either way, a correction of the inaccuracy promoted by Guerin is clearly necessary. Guerin likewise misleads audiences with the inaccurate claim that stabbing attacks on Israelis are “new”. Perhaps if the BBC had reported more than just 0.81% of the terror attacks which took place in the first eight months of this year, its correspondents would be aware of the fact that sixteen stabbing attacks took place between January and August 2015. Audiences are not told that the two year-old is being treated because he too was wounded in the same terror attack. “A short distance away in Bethlehem a Palestinian mother mourns her son. Abdel Rahman Abdullah who was thirteen was killed on Monday by Israeli troops. His mother, Delal, being comforted by neighbours, denies there were clashes at the time. She says a sniper shot her son through the heart. She wants another uprising. Guerin refrains from clarifying to audiences that Bethlehem has been under sole Palestinian Authority control since 1995 and she next fails to provide audiences with adequate context concerning the violent rioting at the border fence near Nahal Oz by some 200 Gaza Strip residents affiliated – according to Arab media outlets – with Hamas and the Palestinian Islamic Jihad. Guerin’s closing remarks steer audiences towards the inaccurate view that the current wave of terror is the result of frustration resulting from the failure of the political process. Neither the Palestinian Islamic Jihad nor Hamas – which has spent months trying to augment its terror activities in PA ruled areas – are interested in a negotiated two-state solution to the Arab-Israeli conflict. Guerin’s framing of the background to this latest wave of terror (of course never named as such by the BBC) is therefore as misleading to audiences as her amplification of propaganda and falsehoods and her portrayals of violent rioters as underdog “protesters” and terrorists inspired by serial incitement as “lone wolves”. They also said the rioters in Gaza were ‘in solidarity’ with Palestinians on the WB. That sounds like a very biased choice of words to me, adopting the narrative language of the Palestinians rather than reporting facts they frequently voice opinions dressed up as facts. That disgusting woman wouldn’t know a fact if it bit her on her sorry arse. She is bigotry on legs. The BBC is editorially anti-Israel, there is enough evidence in the public domain. Lord Hall (Director General of BBC) has not come out in public to challenge these assertions therefore we are left with the assumption that editorial policy at the BBC is to present a biased and one-sided narrative. This is dangerous because it generates a feeling of anti-Semitism and could be positioned as incitement to racial hatred.